If your only gaming experience is at the casinos of Atlantic City, you've probably never given the chips you used much thought. In the city by the sea, every casino has a white $1 chip. Likewise, every club uses pink $2.50 chips, red $5 chips, green $25 chips, and so on. That's how things are done in Jersey, but not so in other places. 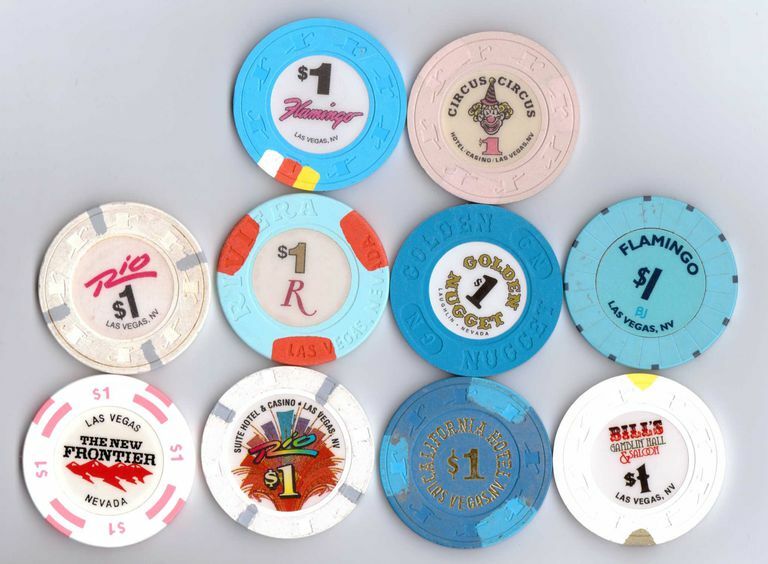 In Nevada, where legalized gaming got its start, you might see mostly red $5 chips and green quarters, but there is no specific law requiring a certain color be used. Thirty years ago you could find $1 chips that were white, yellow, gray, blue, brown and even black. A few years before that, the casinos used Eisenhower dollars, and before that, the casinos used real silver dollars. Imagine that! As for larger denominations, every club can choose their own color. Harrah's used white chips until the late 1980's. Today, their $1 chips are white, and that's more the norm now, partly because casinos are more corporate (with several corporations owning many casinos), and partly for safety. White or Blue chips are one dollar. Red chips are five dollars and are called nickels. Green chips are twenty-five dollars and are called quarters. Black chips are one hundred dollars. Purple Chips are five hundred dollars and are called Barneys. Orange chips are one thousand dollars and are called pumpkins. In the late '90's, a casino in Las Vegas issued one dollar chips that were black in color. This created quite a stir amongst the other casinos who have $100 chips that are black. There were concerns that scam artists would mix some of these in with the legitimate chips. The outcry was substantial and the casino rethought their chip-color choice. The reason casinos use different color chips is to make it easy for the dealers, Pit Bosses, and surveillance workers to determine how much a player is betting. It also makes it fun for people who collect casino chips! By matching the color of the chips with the table signs it makes it easy to tell the minimum bet for a table with just a quick glance. A red sign would denote a five-dollar table and a green sign would tell you that the minimum bet is twenty-five dollars. This makes it convenient for the players. There are some tables that have minimums that don't correspond to chip colors such as $10 and $15 games. All you have to do is note which color sign the casino you are visiting uses. Then remember it for the next time. The casinos in Connecticut use yellow for ten-dollar tables and orange for fifteen-dollar tables. Some casinos may have the same color sign for all table minimums. If this is the case you will need to read them before sitting down. But for most of them, all you will need to do is look for the color of your choice, have a seat and place your bet. 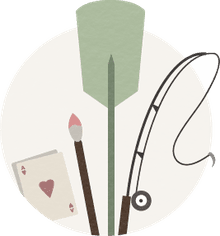 As for the roulette table, you can use the same chips used on other tables, but if you are going to be playing mostly the inside numbers, the dealer will offer you a color. That means you'll get your own chips, with their own denomination. The standard value is $1, but you can have whatever value you want, you just can't cash them in anywhere but at that table - as soon as you are done playing! The reason each player gets their own color is to distinguish who gets what on each winning number selected by the players. If you play roulette, you know that's necessary!